TISHKOVA Inna, Doctor EMC. Make an appointment, ask a question. She graduated with honors from the medical faculty of the Moscow Medical Academy named after I. M. Sechenov in 2001. 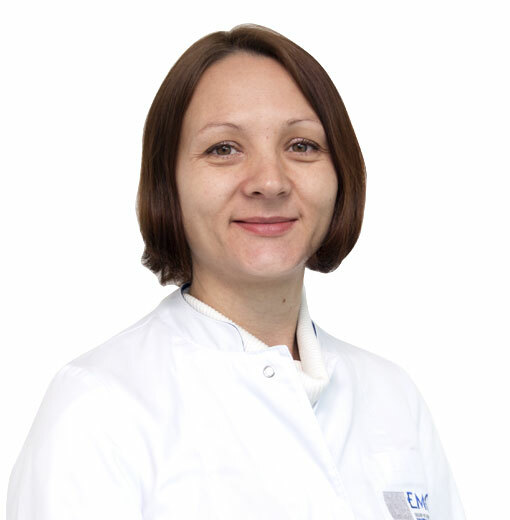 She completed her clinical residency on the basis of the Clinic of Nervous Diseases of the First Moscow Medical University I. M. Sechenov with a degree in nervous diseases in 2003; she defended her PhD thesis in 2011. She was trained at Inselspital clinic, Bern, Switzerland, on the basis of a grant from the European society of neurologists in 2012. She passed a training in "Motor disorders"; she is a certified specialist in the use of botulinum toxin type A in chronic migraine, dystonia and spasticity. She is skilled in the technique of paravertebral blockades, neurocognitive testing of patients with cognitive impairment (Alzheimer's disease, Parkinson's disease).